Set in a beautiful tropical garden Las Palmas offers the ultimate in elegance. With stunning panoramic views of the ocean from the wrap-around verandah, and access to your own private beach from the tropical gardens, Las Palmas provides year round sunshine and the perfect setting for a time out in paradise. The private villa is situated on the north coast of Jamaica in Runaway Bay�s famous mile-long white sand beach, and is just a stone throw away from the first class hotel resort Breezes, where you can experience golf, tennis, and water sports, for the best of both worlds. Las Palmas offers a full staff, fresh water swimming pool with poolside shower and powder rooms. The pool and tropical garden are accessed via sliding patio doors from the lounge and dining area. The dining area is superb for formal dining - the locally-crafted Elm wood dining table seats eight. The shaded patio alongside the large freshwater pool is ideal for alfresco dining - Outdoor lighting creating the perfect ambience. The private Cardiff Hall beach with a designated swimming area is ideal for those who are not strong swimmers and is just steps away. 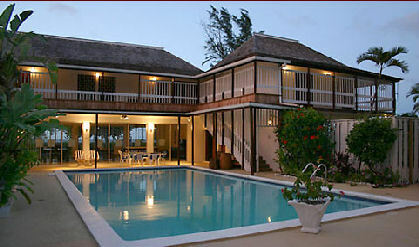 Please contact us to book this perfect Jamaica Villa.